Much has been learned about the environmental and molecular factors that influence the division, migration, and programmed cell death of adult-born neurons in the mammalian brain. However, detailed knowledge of the mechanisms that govern the formation and maintenance of functional circuit connectivity via adult neurogenesis remains elusive. Recent advances in genetic technologies now afford the ability to precisely target discrete brain tissues, neuronal subtypes, and even single neurons for vital reporter expression and controlled activity manipulations. Here, I review current viral tracing methods, heterologous receptor expression systems, and optogenetic technologies that hold promise toward elucidating the wiring diagrams and circuit properties of adult-born neurons. The ongoing addition of new neurons to adult brain circuits represents a remarkable mode of both cellular and structural plasticity. In mammals, two main areas support continued neurogenesis: the subgranular zone (SGZ) of the dentate gyrus in the hippocampus, and the subventricular zone (SVZ) of the lateral ventricle (Alvarez-Buylla and Temple, 1998; Ming and Song, 2005; Zhao et al., 2008). Neurons born in the SGZ migrate short distances to the dentate granule cell layer and differentiate into dentate granule cells (Song et al., 2002), whereas those born in the SVZ migrate anteriorly and differentiate into inhibitory interneurons of the olfactory bulb, including both granule and periglomerular cells (Lledo and Saghatelyan, 2005; Bovetti et al., 2007). It is generally thought that turnover, replacement, or de novo integration of newborn neurons into these brain regions may be important for different forms of learning, memory, mood control, and/or perception (Gheusi et al., 2000; Santarelli et al., 2003; Kempermann et al., 2004; Imayoshi et al., 2008; Zhang et al., 2008; Breton-Provencher et al., 2009). Since the discovery of adult neurogenesis nearly four decades ago (Altman and Das, 1965a,b), a great deal of emphasis has been placed on better understanding the mechanisms underlying this phenomenon for potential therapeutic avenues in cell-based tissue repair. Similar in many ways to normal neurodevelopment, adult neurogenesis shares several conserved molecular and genetic programs that influence progenitor cell division, migration, neuronal differentiation, and circuit integration (Esposito et al., 2005; Duan et al., 2008). However, whereas in embryogenesis where most of the nervous system develops in concert, adult-born neurons must navigate through the established cellular and extracellular environments of the mature brain. Because the mechanisms of adult-born neuron circuit integration come under the dynamic influence of preexisting tissues and brain structures, this represents a strikingly different scenario than early brain development. Newborn neurons in the adult must make their way into established brain circuits via a host of different guidance and survival cues, including a milieu of membrane-bound and secreted factors, functioning neuronal networks, and a range of different synaptic and extrasynaptic inputs. In addition, it is now appreciated that numerous extrinsic physiological and pathological processes that affect overall brain function also directly influence adult-born neuron circuit integration (Zhao et al., 2008; Ma et al., 2009; Suh et al., 2009). Several elegant electrophysiological, electron microscopy, and in vivo imaging studies in rodents have begun to identify the types of synaptic interactions that accompany the development and integration of newborn neurons into adult brain circuits (Belluzzi et al., 2003; Carleton et al., 2003; Ming and Song, 2005; Mizrahi et al., 2006; Toni et al., 2008; Livneh et al., 2009; Panzanelli et al., 2009; Whitman and Greer, 2009). Although several principles of adult-born neuron birth, migration, and integration into adult brain circuits are similar between the hippocampus and olfactory system, they also contrast in many ways. Notable differences include the terminal cell types generated, migration distances, and final patterns of connectivity. Our knowledge continues to expand with regards to the exact forms of synaptic and/or neuromodulatory input that adult-born neurons receive during sequential stages of neuronal maturation and circuit integration in both systems. In the hippocampal formation, newborn neurons are known to receive local GABAergic inputs during early stages of integration. Similar to what occurs in development, this GABAergic drive is considered to be excitatory and capable of depolarizing newborn neurons (Overstreet Wadiche et al., 2005; Ge et al., 2006, 2007). Also during this time, newborn dentate granule cells begin to establish contacts with their CA3 targets. With maturation, GABAergic input from local interneurons becomes inhibitory, and new excitatory synaptic inputs are made onto the newborn neurons from the entorhinal cortex. Alongside the known connectivity onto the neurons themselves, the neurogenic niche of the hippocampus also receives extensive input from several brain regions, including the septum, ventral tegmental area, locus coeruleus, median raphe nucleus, and supramammillary region (Freund and Buzsaki, 1996; Zhao et al., 2008; Figure 1). It remains unknown how these different types of inputs modulate the incorporation, survival, and maturation of granule cells in the dentate gyrus and their importance for learning and memory. Figure 1. Schematic of the inputs to regions of adult neurogenesis and circuit formation. Illustration of a sagittal section through the rodent brain. Orange areas depict regions of adult neurogenesis and circuit development. Blue arrows extending to the olfactory bulb (OB), and dentate gyrus (DG) originate from brain structures that have inputs to these areas. Many of these structures have inputs to both the OB and DG. SVZ, subventricular zone; AON, anterior olfactory nucleus; PCTX, piriform cortex; pACTX, periamygdaloid cortex; SPT, septum; ECTX, entorhinal cortex; VTA, ventral tegmental area; DB, nucleus of the diagonal band; SMR, supramammillary region; RN, raphe nucleus; LC, locus coeruleus. Similar to the hippocampus, the survival, integration, and maturation of newborn neurons in the olfactory bulb is thought to require excitatory drive from multiple brain regions onto the developing granule cells (Pathania et al., 2010). As the newborn olfactory bulb neurons migrate anteriorly, mature, and take residence within local bulbar networks, they first receive GABAergic input (Belluzzi et al., 2003; Carleton et al., 2003), followed shortly after by local inputs from olfactory sensory neurons, mitral cells, and various short axon cell types (Shepherd, 2004). However, some of the first contacts onto newborn granule and periglomerular cells are thought to come from centrifugal fibers (Panzanelli et al., 2009). The number and type of centrifugal inputs to the bulb is vast, including connections from the anterior olfactory nucleus, piriform, periamygdaloid, and lateral entorhinal cortices, as well as neuromodulatory input from the nucleus of the diagonal band, raphe nuclei, and locus coeruleus (Shipley and Ennis, 1996; Whitman and Greer, 2009). Interestingly, both of the neurogenic regions in the brain have inputs from common structures (Figure 1). In both scenarios it takes roughly 1 month for adult-born neurons to become synaptically integrated into functional brain circuits. Ultimately, only about one half of all neurons born at any given time point survive this process and escape cell death, a phenomenon that is thought to be activity-dependent (van Praag et al., 1999; Petreanu and Alvarez-Buylla, 2002; Rochefort et al., 2002; Leuner et al., 2004; Alonso et al., 2006; Ma et al., 2009). Considering the timing, diversity, and nature of the inputs to adult neurogenic regions and the neurons born from them, it is reasonable to speculate that signals from both centrifugal and local pathways likely play discrete roles at different stages of newborn neuron survival and circuit integration. However, it remains to be determined which of these different inputs make direct synaptic contacts onto newborn neurons, and when during circuit integration they might act. Given the complexity of the synaptic networks, the shear number and types of cells that make up the brain, and the dynamic interplay between the various intrinsic and extrinsic factors known to influence adult neurogenesis, many of the detailed molecular programs that underlie the circuit integration process remain elusive. In order to better understand the mechanisms that link the environment and sensory experience to the genetic pathways and molecules that facilitate ongoing synapse and circuit formation in the adult brain, it is essential to first crack the neuroanatomical code of cellular connectivity made onto newborn neurons as they form synapses and circuits. Identifying the precise neuronal subtypes that provide inputs onto adult-born neurons promises to reveal key molecular pathways that facilitate and govern this fascinating phenomenon. With such knowledge, genetic manipulations aimed at promoting the synthetic enrichment of adult-born neurons to target brain regions become imaginable. To date, this goal has remained a challenge. We have now entered an astounding new era of molecular and genetic neuroscience. Through experimental creativity and novel genetic engineering methods, recent technological advances now allow investigators to mark, manipulate, and image neurons and their associated synaptic networks (Arenkiel and Ehlers, 2009; O’Connor et al., 2009). With the ability to precisely target discrete brain tissues, neuronal subtypes, and even single neurons for vital reporter expression and controlled activity manipulations, we are now afforded the opportunity to query previously intractable aspects of brain wiring (Luo et al., 2008). On the forefront of this endeavor lies a widespread interest to better understand the molecular mechanisms that govern adult-born neuron circuit integration. Here I review current viral tracing methods, heterologous receptor expression systems, and optogenetic technologies that hold promise toward elucidating the wiring diagrams and circuit properties of adult-born neurons. In addition, these technologies allow for direct manipulation of circuit activity, which will undoubtedly reveal unknown roles of adult neurogenesis in normal brain function, animal behavior, and perhaps provide clues toward harnessing adult-born neurons for cell-based circuit repair. Owing to the complexity of the mammalian brain, it has remained a major challenge to decipher the patterns of connectivity made onto and by newborn neurons as they integrate into circuits of the adult brain. With major advances in both molecular genetics and light microscopy, our ability to query not only neuronal morphologies, but also the molecular and cellular composition of individual neurons and their associated synaptic networks has become possible. Marking and manipulating neurons through transgenic and gene targeting technologies in the rodent (Brinster et al., 1981; Capecchi, 1989) now allows investigators to “program” neuronal subsets with unprecedented precision (Arenkiel and Ehlers, 2009). Arguably, one of the most influential contributions to contemporary neuroscience has been the use of fluorescent proteins (FPs; Shimomura et al., 1962; Chalfie et al., 1994) and their targeted expression in living neurons of the mammalian brain tissue. The wide array of FPs available provides an ever-expanding toolbox of vital reporters and gene expression tags (Feng et al., 2000; Giepmans et al., 2006). Applications for these proteins range from vital reporters expressed throughout the cytoplasm to subcellular protein fusion tags, which together can be used to monitor the process of circuit integration in vivo using both electrophysiological methods and fluorescent imaging. Beyond merely marking cells for identification, a number of other methods have been developed to exploit the vital properties of FPs to investigate neuronal properties. For example, superecliptic pHluorin, which fluoresces at neutral pH but is quenched at acidic pH, can be used to monitor the trafficking and exchange of intracellular compartments within neurons (Miesenbock et al., 1998). This variant allows direct imaging of membrane dynamics, exocytosis and endocytosis of synaptic receptors, and neurotransmitter release in vitro and in vivo (Bozza et al., 2004; Fernandez-Alfonso et al., 2006; Park et al., 2006; Kennedy et al., 2010). More recently, a new method termed GFP reconstitution across synaptic partners (GRASP) shows promise for revealing synaptic interactions between contacting neurons. By tethering split GFP fragments to separate pre- and post-synaptic proteins, reconstitution of GFP fluorescence can be observed when genetically targeted cells form synaptic pairs (Feinberg et al., 2008). Although this technology has been successfully applied to reveal invertebrate synapses, it has yet to be demonstrated in rodents (Gordon and Scott, 2009). The range of FP reporters for visualizing neuronal morphologies, cellular dynamics, and synapse function continues to expand. However, perhaps the single-most limiting factor for using FPs in neuroscience is our incomplete knowledge of neuronal gene regulation. Often transgenic reporters fail to recapitulate endogenous patterns of gene expression, or such patterns are too broad to identify neuronal subtypes with cellular precision. The introduction of gene targeting and BAC transgenics has helped circumvent many of these issues (Gong et al., 2003), but at times low levels of “single-copy” reporter expression can be experimentally limiting. Further characterization of cell type-specific promoter activities to drive targeted FP expression in discrete neuronal populations will certainly expand the ability for precise spatiotemporal neuroanatomical investigation. Ultimately however, the exploitation of FPs and their cast of variants has allowed investigators to genetically probe adult-born neuron circuit integration with limits only bounded by experimental creativity. A major goal toward understanding mechanisms of neuronal development, synapse formation, and circuit wiring has been to elucidate nodes and patterns of synaptic connectivity. A creative angle to address this challenge has been the incorporation of genes encoding FPs and FP-fusion proteins into neurotropic viral vectors, which show the innate ability to infect neurons and trans-synaptically spread throughout the nervous system (Kuypers and Ugolini, 1990; Callaway, 2008). Two types of viruses that have been broadly employed for this purpose include rabies and herpes. Herpes viruses belong to a family of double-stranded DNA viruses, while rabies belongs to a family of negative-strand RNA viruses (Voyles, 1993). Although evolutionarily different, they are both endowed with the unique ability to bind to and infect neuronal cells. This cell type-specific infectivity is conferred to the viruses via their mature enveloped coat particles, which are made of both host membrane and virally encoded glycoproteins. The composite envelope proteins are the determinants that mediate neuronal membrane recognition and subsequent neuron-to-neuron infection by binding to membrane surface receptors. Herpes viruses have been used to label neural circuits for years. Two common tracing strains are herpes simplex virus-1 (HSV-1; Lilley et al., 2001) and pseudorabies virus (PRV; Enquist, 2002). Both of these variants predominantly spread in a retrograde direction, and each has been effectively applied to dissect synapse and circuit connections in the rodent brain (Callaway, 2008). However, one limitation to using the herpes viruses for circuit analysis is polysynaptic spreading. Due to the vast cohort of cell types within brain tissue, the number of synapses formed on each of those cells, and the high degree of interconnectivity in intact neural circuits, this approach still poses a challenge to dissect precise patterns of neural connectivity. To simplify trans-synaptic circuit analysis, Wickersham et al. 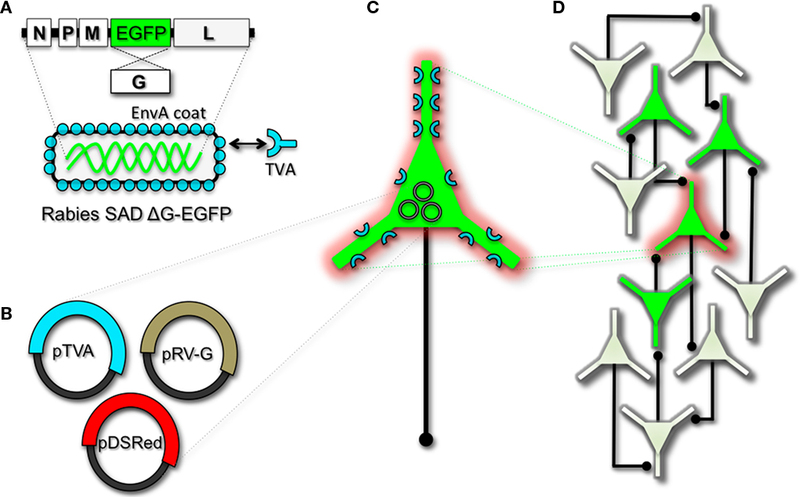 (2007b) devised a clever coat protein complementation strategy that allows for monosynaptic tracing of neuronal connections using a pseudotyped rabies virus (RV). Not to be confused with PRV (which as stated above is actually a herpes virus), pseudotyping a viral particle refers to synthetically modifying the viral envelope to recognize a foreign receptor not normally present on the membranes of mammalian neurons. The strategy will be briefly discussed below, and for further reference also see Wickersham et al. (2007a), Arenkiel and Ehlers (2009), Hasenstaub and Callaway (2010). The RV gene encoding its glycoprotein (termed G) has been the primary target for genetic modification and RV vector engineering. Removal of G from the RV genome renders the virus both incapable of generating infective particles and replication incompetent. However, even in the absence of the native glycoprotein gene, RV is still capable of expressing its genome. Thus, G can be replaced with sequences encoding FPs or FP-tagged biomolecules to generate RV vectors for vital reporter expression (Wickersham et al., 2007a). To make these replication incompetent viruses useful for circuit tracing studies, they must be “armed” by providing an envelope in trans by propagating and packaging the particles in vitro using cell lines engineered to synthesize the required glycoprotein. To perform monosynaptic circuit tracing and target FP-expressing RV to desired neuronal subsets, the particles can first be pseudotyped with the foreign coat protein EnvA from avian sarcoma leukosis virus, which specifically binds to a class of avian membrane proteins called TVA receptors (Barnard et al., 2006). Genetic targeting of neuronal subsets for TVA expression directs RV infection to only those neurons. To facilitate monosynaptic tracing, Wickersham et al. (2007a) added a clever twist on this approach. By introducing a plasmid that encodes the wildtype RV G-protein, the disarmed EGFP-expressing virus is now able to undergo one round of subsequent infection to presynaptic partners of TVA-targeted neurons. Since only the initially infected neuron contains G, viral spread ceases after one round of monosynaptic jumping. Including a plasmid encoding a red FP allows the cell originally targeted for infection to be identified amongst the monosynaptic network of GFP labeled cells (Figure 2). Of course it must be considered that true monosynaptic tracing is dependent on targeting individual neurons for the expression of G. If for example synaptically coupled cells both harbor G, but only one of them serves as the primary source cell of TVA-mediated infection, then viral spread can become multisynaptic through subsequent rounds of viral packaging in presynaptic partners. Monosynaptic tracing control thus depends directly upon the precision of neuronal targeting for the RV tracing components. Figure 2. Engineering and pseudotyping rabies virus (RV) for transneuronal tracing. (A) RV can be genetically engineered to express EGFP by replacing the genomic sequence encoding the G coat protein. The genetically modified G-deletion mutant RV must be propagated in vitro to supply a coat protein. The particle can thus be pseudotyped by providing a foreign coat protein such as EnvA, which originates from the avian leukosis virus and binds specifically to it its cognate receptor TVA. EnvA pseudotyped RV can be used to selectively infect neurons that have been genetically targeted for TVA expression. By including additional constructs that encode the wildtype G-capsid protein and a red-colored “cell fill” (B), the modified RV can be genetically targeted to individual neurons for restricted circuit mapping and monosynaptic tracing (C). Since no endogenous receptors exist in the mammalian brain for EnvA, only neurons that are programmed to express TVA are capable of being infected by the EnvA pseudotyped virions. Because the wildtype G-protein sequence has been deleted from the RV genome, G must be supplied by complementation to allow trans-synaptic spread from the neurons targeted for infection. (D) Viral spread ceases monosynaptically due to the absence of G in unmodified neuronal populations. This new technology now makes it feasible to dissect complicated patterns of neuronal connectivity with synaptic precision (Stepien et al., 2010; Weible et al., 2010). Targeting adult-born neurons for monosynaptic circuit tracing holds certain promise toward elucidating the numbers, types, and synaptic inputs that might usher and/or promote the formation and maintenance of functional circuit integration. Unfortunately however, much needs to be learned about the viral mechanisms of infectivity, trans-synaptic propagation, and replication to make viral tracing methods broadly applicable for detailed circuit analysis throughout the nervous system. For example, one major limitation to viral-mediated circuit tracing using either HSV or RV type vectors is the inevitable deterioration of neuronal cell health with time (Callaway, 2008). Whereas the HSV particles show rapid and high levels of expression within 1–2 days, they also show a lytic-type phase of replication that induces neuronal loss within 1–2 weeks. Although most neurons appear to tolerate RV infection for longer periods of time, they too eventually show signs of dysfunction and poor health beyond 2 weeks. In addition, not much is known regarding the exact tropism for the various viruses to infect particular subtypes of neurons. Although it is clear that viral particles can cross axo-dendritic, dendro-dendritic, glutamatergic, and GABAergic synapses (Willhite et al., 2006; Wickersham et al., 2007b; Stepien et al., 2010; Miyamichi et al., 2011; Rancz et al., 2011), the different efficacies of transfer have not been determined. Preferential binding of viral particles to different types of presynaptic proteins must exist, which would ultimately result in more efficient transfer of viruses between certain synaptic pairs. This information is currently unknown, thus it remains a challenge to reliably perform unbiased quantitative circuit analysis using viruses over extended periods of time. Although current trans-synaptic circuit tracing methods are in their infancy, with further understanding of the viral mechanisms, and a subsequent “re-tooling” of existing vectors, one can easily imagine that this experimental avenue for intact circuit mapping will become indispensable. Moreover, this methodology holds definite promise to address outstanding questions in adult neurogenesis, ranging from identification of the types of connections that are dynamically made and broken during circuit development, to exposing the complete cohort of input types that are observed in mature circuits within the intact brain. Earmarking neuronal subsets and their associated networks for has been invaluable toward our current understanding of neuronal morphologies and circuit architecture. However, to fully understand the cellular and molecular mechanisms that guide adult-born neuron synapse formation and circuit integration, we must be able to probe neuronal connectivity. Recent advances in genetically encoded actuators now provide this possibility. Technologies such as heterologous receptor or channel expression, optogenetics, and genetically encoded synaptic toxins are beginning to allow functional circuit mapping with synaptic precision (Luo et al., 2008; Arenkiel and Ehlers, 2009; Figure 3). By targeting pre- or post-synaptic cell types for activity manipulations, coupled with functional imaging and/or electrophysiological recordings, it is now possible to genetically dissect circuit nodes by monitoring evoked synthetic output responses. Some of the earliest efforts to genetically control neuronal output relied on engineered expression of heterologous receptors in neurons that normally do not show their presence. For example, expression of modified opiate receptors in the brains of transgenic mice showed that introducing synthetic exogenous ligands could activate neuronal subsets (Zhao et al., 2003). To date, numerous variations on this theme have proven effective for both driving neuronal excitability and inhibition. 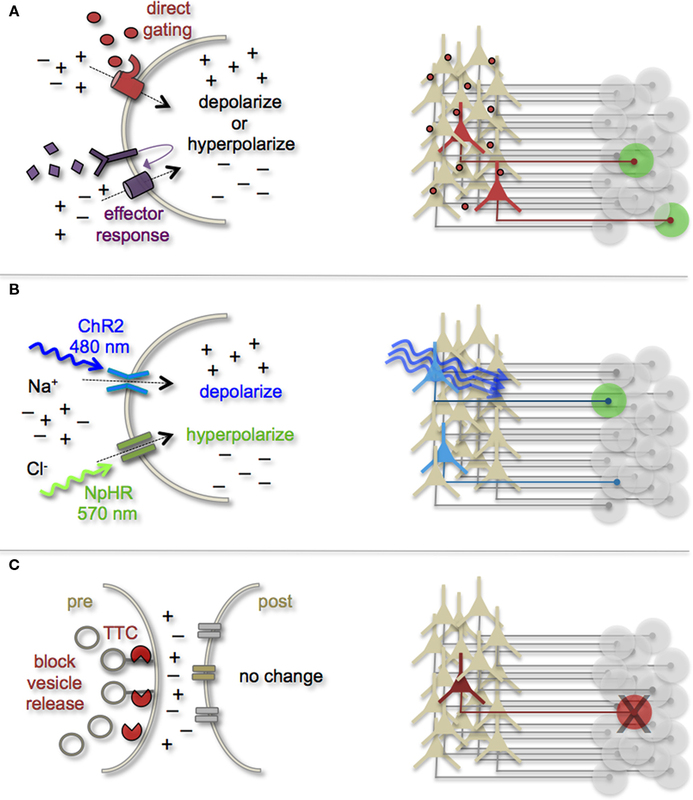 Models for promoting depolarization and increased neuronal firing have spanned custom G-protein-coupled receptors designed for sensitivity to synthetic ligands (Conklin et al., 2008), hyperdopaminergic drive through ectopic acetylcholine receptor activation (Drenan et al., 2008), and conditional expression and activation of the rat TRPV1 receptor in select population of neurons (Arenkiel et al., 2008). Methods to induce hyperpolarization or inhibit action potential generation have included targeted expression of the Drosophila allostatin receptor and the C. elegans ivermectin channel, which promote opening of inward-rectifying K+ channels or chloride channels respectively (Tan et al., 2006; Lerchner et al., 2007; Wehr et al., 2009). Orthogonal strategies to these methods have been to genetically express small-molecules for inactivation of synaptic transmission (Karpova et al., 2005), or toxins that disrupt synaptic transmission (Harms et al., 2005; Ehlers et al., 2007). Figure 3. Genetic strategies to mark and manipulate neurons and circuits. (A) Neurons can be targeted for heterologous receptor expression. These foreign receptors can be either directly or indirectly gated by application of exogenous ligands (depicted as red ovals and purple diamonds). Left: heterologous receptor activation via application of synthetic ligands can be used to change a neuron’s ionic equilibrium and thus firing properties. Right: depending on molecular properties, exogenous ligands spread variably throughout brain tissue. All neurons expressing the heterologous receptors are capable of being activated and driving target cell responses (represented as green circles). (B) Expression of light-gated channels can be used to modulate neuronal firing with photons. Left: ChR-2 is a non-selective cation channel that responds optimally to blue light. Photostimulating this channel results in positive inward currents, depolarization, and neuronal firing. NpHR is a photoactive chloride pump that responds optimally to greenish-yellow light. Photostimulating this pump protein results in negative inward currents, hyperpolarization, and neuronal silencing. Right: FP-fusion reporters can be used to identify cells that express photoresponsive proteins (represented by blue coloring). Only neurons expressing the photoresponsive channels and receive photons show light activated modulation, whereas downstream circuit targets can be monitored for post-synaptic photo responses (green coloring). (C) Targeted expression of synaptic toxins in neurons can be used to block synaptic vesicle release and inhibit neurotransmission to post-synaptic targets. TTC, tetanus toxin. In several models mentioned above, temporal control of neuronal activity (excitatory or inhibitory) is gained by providing the target molecule’s “designer” ligand (Figure 3A). It must be cautioned, that although these avenues for manipulating neuronal output by the introduction of exogenous ligands are still bounded by biophysical properties of the ligands themselves. In many cases, it has been notoriously difficult to predict a ligands efficacy for crossing the mammalian blood–brain barrier, as well as determining the binding kinetics for the engineered receptor within the complex tissue environment that comprises the brain. Not all genetically encoded channel systems require the presence or absence of a ligand to influence neuronal firing however. It is also possible to directly modify the excitability of a cell by overexpressing or ectopically expressing ion-specific channels to alter a neuron’s ionic equilibrium. In fact, this experimental design has been previously implemented to directly query how changes in membrane excitability influence the ability for newborn neurons in the olfactory system to survive and integrate into bulbar circuits (Lin et al., 2010). Within the last few years, genetic manipulation of neuronal activity has rapidly moved beyond expression of ectopic ligand-gated and rectifying channels. Light responsive proteins now facilitate control of neuronal firing with fast kinetics and millisecond precision. The burgeoning field of optogenetics provides the means to either increase neuronal firing by targeted expression of the Channelrhodopsins, or decrease firing with Halorhodopsins (Zhang et al., 2007a, 2010). The Channelrhodopsins comprise a family of light-gated cation channels that were originally identified and cloned from the green algae Chlamydomonas reinhardtii (Nagel et al., 2005), whereas the Halorhodopsins are light-driven chloride ion pumps from halobacteria (Chow et al., 2010). Each of these classes of light responsive proteins is gated by different photo spectra. Channelrhodopsin-2 (ChR-2) shows a peak response to blue light (480 nm; Nagel et al., 2003), whereas NpHR responds optimally to greenish-yellow light (570 nm; Zhang et al., 2007b; Figure 3B). Not only can these photoresponsive channels be used independently to turn neurons “on” or “off,” but they can also be used in combination to provide control over both states by toggling the color of light used for photoillumination (Han and Boyden, 2007; Zhang et al., 2007b). The power of this of technology has transformed modern circuit mapping in living brain tissue. Thus far, applications have ranged from microcircuit analysis to long-range connectivity studies in vivo (Arenkiel et al., 2007; Petreanu et al., 2007; Wang et al., 2007). Additionally, optogenetic mapping of deep brain circuits has begun to reveal previously unknown patterns of connectivity that underlie complex behaviors and neuropsychiatric disorders (Deisseroth, 2010; Lin et al., 2011). Aside from a handful of recent elegant studies (Toni et al., 2008; Bardy et al., 2010), optogenetic technology has not been broadly applied to investigate adult-born neuron circuit integration in vivo. It is intriguing to contemplate different experimental designs that might be used to genetically dissect the input/output relationships between pre- and post-synaptic connections that are made during the circuit integration process. This might be accomplished by selectively targeting neuronal subtypes with known inputs onto newborn neurons for photostimulation, or photoinactivation. Alternatively, optogenetic reporters could be expressed in newborn neuron populations at different stages of circuit development to assess cell autonomous effects of activity upon survival, synapse formation, and circuit maintenance. An appealing consideration for using optogenetics in this line of experimentation is the versatility of subtype-specific targeting, as well as the dynamic range of neuronal control that is possible. However, it must still be acknowledged that optogenetic technology still remains relatively nascent. In all of its elegance, experimental applications are still bounded by the biophysical parameters of delivering light into the brain. Aside from superficial target domains such as the cortex, or perhaps the surface of the olfactory bulb, photon delivery requires invasive brain surgery and/or the introduction of foreign material such as fiber optics into target deep brain tissues for photostimulation. Nonetheless, these new methods for genetically marking and manipulating cells of the olfactory system hold great promise to broaden our understanding of the activity-dependent mechanisms that underlie adult-born neuron circuit integration. To date, many of the experimental methods that have been used to investigate the propensity for adult-born neurons to find their way into functional circuits have relied on direct imaging or recording the electrophysiological properties of newborn neurons at different stages of development. Through this cumulative work we have gained a wealth of knowledge about the amazing capacity of the adult brain to continually remodel its own structure and function. We now have the power to dissect neuron and circuit activities with genetic precision, as well as label and identify synaptically coupled neural networks. Once we begin to reveal the various pre- and post-synaptic cell types that comprise adult-born neuronal circuits, we then might be able to probe the synaptic contributions of discrete inputs to promote and/or guide adult circuitogenesis. These new technologies not only provide new avenues for our continual learning about neural development and circuit formation, but they also may reveal novel insights into the fundamental principles that underlie the phenomenon of adult neurogenesis. A comprehensive understanding of this elusive and intriguing process will require creative and multifaceted experimental inquiry. The brain’s map is nothing less than extremely complex; understanding the dynamic and plastic properties of continued “wiring” will require our best efforts. I would like to thank Tom Newpher, Mirjana Maletic-Savatic, Jeff Neul, and Jennifer Selever for thoughtful comments on this manuscript. Also, I would like to apologize for those primary works not referenced here due to space limitations. Funding through the McNair Foundation, NINDS award R00NS064171, and NARSAD supported this work. Alonso, M., Viollet, C., Gabellec, M. M., Meas-Yedid, V., Olivo-Marin, J. C., and Lledo, P. M. (2006). Olfactory discrimination learning increases the survival of adult-born neurons in the olfactory bulb. J. Neurosci. 41, 10508–10513. Altman, J., and Das, G. D. (1965a). Autoradiographic and histological evidence of postnatal hippocampal neurogenesis in rats. J. Comp. Neurol. 124, 319–335. Altman, J., and Das, G. D. (1965b). Post-natal origin of microneurones in the rat brain. Nature 207, 953–956. Alvarez-Buylla, A., and Temple, S. (1998). Stem cells in the developing and adult nervous system. J. Neurobiol. 36, 105–110. Arenkiel, B. R., and Ehlers, M. D. (2009). Molecular genetics and imaging technologies for circuit-based neuroanatomy. Nature 461, 900–907. Arenkiel, B. R., Klein, M. E., Davison, I. G., Katz, L. C., and Ehlers, M. D. (2008). Genetic control of neuronal activity in mice conditionally expressing TRPV1. Nat. Methods 5, 299–302. Arenkiel, B. R., Peca, J., Davison, I. G., Feliciano, C., Deisseroth, K., Augustine, G. J., Ehlers, M. D., and Feng, G. (2007). In vivo light-induced activation of neural circuitry in transgenic mice expressing channelrhodopsin-2. Neuron 54, 205–218. Bardy, C., Alonso, M., Bouthour, W., and Lledo, P. M. (2010). How, when, and where new inhibitory neurons release neurotransmitters in the adult olfactory bulb. J. Neurosci. 30, 17023–17034. Barnard, R. J., Elleder, D., and Young, J. A. (2006). Avian sarcoma and leukosis virus-receptor interactions: from classical genetics to novel insights into virus-cell membrane fusion. Virology 344, 25–29. Belluzzi, O., Benedusi, M., Ackman, J., and LoTurco, J. J. (2003). Electrophysiological differentiation of new neurons in the olfactory bulb. J. Neurosci. 23, 10411–10418. Bovetti, S., Peretto, P., Fasolo, A., and De Marchis(2007). Spatio-temporal specification of olfactory bulb interneurons. J. Mol. Histol. 38, 563–569. Bozza, T., McGann, J. P., Mombaerts, P., and Wachowiak, M. (2004). In vivo imaging of neuronal activity by targeted expression of a genetically encoded probe in the mouse. Neuron 42, 9–21. Breton-Provencher, V., Lemasson, M., Peralta, M. R. III, and Saghatelyan, A. (2009). Interneurons produced in adulthood are required for the normal functioning of the olfactory bulb network and for the execution of selected olfactory behaviors. J. Neurosci. 29, 15245–15257. Brinster, R. L., Chen, H. Y., Trumbauer, M., Senear, A. W., Warren, R., and Palmiter, R. D. (1981). Somatic expression of herpes thymidine kinase in mice following injection of a fusion gene into eggs. Cell 27, 223–231. Callaway, E. M. (2008). Transneuronal circuit tracing with neurotropic viruses. Curr. Opin. Neurobiol. 18, 617–623. Capecchi, M. R. (1989). Altering the genome by homologous recombination. Science 244, 1288–1292. Carleton, A., Petreanu, L. T., Lansford, R., Alvarez-Buylla, A., and Lledo, P. M. (2003). Becoming a new neuron in the adult olfactory bulb. Nat. Neurosci. 6, 507–518. Chalfie, M., Tu, Y., Euskirchen, G., Ward, W. W., and Prasher, D. C. (1994). Green fluorescent protein as a marker for gene expression. Science 263, 802–805. Chow, B. Y., Han, X., Dobry, A. S., Qian, X., Chuong, A. S., Li, M., Henninger, M. A., Belfort, G. M., Lin, Y., Monahan, P. E., and Boyden, E. S. (2010). High-performance genetically targetable optical neural silencing by light-driven proton pumps. Nature 463, 98–102. Conklin, B. R., Hsiao, E. C., Claeysen, S., Dumuis, A., Srinivasan, S., Forsayeth, J. R., Guettier, J. M., Chang, W. C., Pei, Y., McCarthy, K. D., Nissenson, R. A., Wess, J., Bockaert, J., and Roth, B. L. (2008). Engineering GPCR signaling pathways with RASSLs. Nat. Methods 5, 673–678. Deisseroth, K. (2010). Controlling the brain with light. Sci. Am. 303, 48–55. Drenan, R. M., Grady, S. R., Whiteaker, P., McClure-Begley, T., McKinney, S., Miwa, J. M., Bupp, S., Heintz, N., McIntosh, J. M., Bencherif, M., Marks, M. J., and Lester, H. A. (2008). In vivo activation of midbrain dopamine neurons via sensitized, high-affinity alpha 6 nicotinic acetylcholine receptors. Neuron 60, 123–136. Duan, X., Kang, E., Liu, C. Y., Ming, G. L., and Song, H. (2008). Development of neural stem cell in the adult brain. Curr. Opin. Neurobiol. 18, 108–115. Ehlers, M. D., Heine, M., Groc, L., Lee, M. C., and Choquet, D. (2007). Diffusional trapping of GluR1 AMPA receptors by input-specific synaptic activity. Neuron 54, 447–460. Enquist, L. W. (2002). Exploiting circuit-specific spread of pseudorabies virus in the central nervous system: insights to pathogenesis and circuit tracers. J. Infect. Dis. 186(Suppl. 2), S209–S214. Esposito, M. S., Piatti, V. C., Laplagne, D. A., Morgenstern, N. A., Ferrari, C. C., Pitossi, F. J., and Schinder, A. F. (2005). Neuronal differentiation in the adult hippocampus recapitulates embryonic development. J. Neurosci. 25, 10074–10086. Feinberg, E. H., Vanhoven, M. K., Bendesky, A., Wang, G., Fetter, R. D., Shen, K., and Bargmann, C. I. (2008). GFP reconstitution across synaptic partners (GRASP) defines cell contacts and synapses in living nervous systems. Neuron 57, 353–363. Feng, G., Mellor, R. H., Bernstein, M., Keller-Peck, C., Nguyen, Q. T., Wallace, M., Nerbonne, J. M., Lichtman, J. W., and Sanes, J. R. (2000). Imaging neuronal subsets in transgenic mice expressing multiple spectral variants of GFP. Neuron 28, 41–51. Fernandez-Alfonso, T., Kwan, R., and Ryan, T. A. (2006). Synaptic vesicles interchange their membrane proteins with a large surface reservoir during recycling. Neuron 51, 179–186. Ge, S., Goh, E. L., Sailor, K. A., Kitabatake, Y., Ming, G. L., and Song, H. (2006). GABA regulates synaptic integration of newly generated neurons in the adult brain. Nature 439, 589–593. Ge, S., Pradhan, D. A., Ming, G. L., and Song, H. (2007). GABA sets the tempo for activity-dependent adult neurogenesis. Trends Neurosci. 30, 1–8. Gheusi, G., Cremer, H., McLean, H., Chazal, G., Vincent, J. D., and Lledo, P. M. (2000). Importance of newly generated neurons in the adult olfactory bulb for odor discrimination. Proc. Natl. Acad. Sci. U.S.A. 97, 1823–1828. Giepmans, B. N., Adams, S. R., Ellisman, M. H., and Tsien, R. Y. (2006). The fluorescent toolbox for assessing protein location and function. Science 312, 217–224. Gordon, M. D., and Scott, K. (2009). Motor control in a Drosophila taste circuit. Neuron 61, 373–384. Harms, K. J., Tovar, K. R., and Craig, A. M. (2005). Synapse-specific regulation of AMPA receptor subunit composition by activity. J. Neurosci. 25, 6379–6388. Hasenstaub, A. R., and Callaway, E. M. (2010). Paint it black (or red, or green): optical and genetic tools illuminate inhibitory contributions to cortical circuit function. Neuron 67, 681–684. Imayoshi, I., Sakamoto, M., Ohtsuka, T., Takao, K., Miyakawa, T., Yamaguchi, M., Mori, K., Ikeda, T., Itohara, S., and Kageyama, R. (2008). Roles of continuous neurogenesis in the structural and functional integrity of the adult forebrain. Nat. Neurosci. 11, 1153–1161. Karpova, A. Y., Tervo, D. G., Gray, N. W., and Svoboda, K. (2005). Rapid and reversible chemical inactivation of synaptic transmission in genetically targeted neurons. Neuron 48, 727–735. Kempermann, G., Wiskott, L., and Gage, F. H. (2004). Functional significance of adult neurogenesis. Curr. Opin. Neurobiol. 14, 186–191. Kennedy, M. J., Davison, I. G., Robinson, C. G., and Ehlers, M. D. (2010). Syntaxin-4 defines a domain for activity-dependent exocytosis in dendritic spines. Cell 141, 524–535. Kuypers, H. G., and Ugolini, G. (1990). Viruses as transneuronal tracers. Trends Neurosci. 13, 71–75. Lerchner, W., Xiao, C., Nashmi, R., Slimko, E. M., van Trigt, L., Lester, H. A., and Anderson, D. J. (2007). Reversible silencing of neuronal excitability in behaving mice by a genetically targeted, ivermectin-gated Cl-channel. Neuron 54, 35–49. Leuner, B., Mendolia-Loffredo, S., Kosorovitskiy, T., Samburg, D., Gould, E., and Shors, T. J. (2004). Learning enhances the survival of neurons beyond the time when the hippocampus is required for memory. J. Neurosci. 24, 7477–7481. Lin, C. W., Sim, S., Ainsworth, A., Okada, M., Kelsch, W., and Lois, C. (2010). Genetically increased cell-intrinsic excitability enhances neuronal integration into adult brain circuits. Neuron 65, 32–39. Lin, D., Boyle, M. P., Dollar, P., Lee, H., Lein, E. S., Perona, P., and Anderson, D. J. (2011). Functional identification of an aggression locus in the mouse hypothalamus. Nature 470, 221–226. Livneh, Y., Feinstein, N., Klein, M., and Mizrahi, A. (2009). Sensory input enhances synaptogenesis of adult-born neurons. J. Neurosci. 29, 86–97. Lilley, C. E., Branston, R. H., and Coffin, R. S. (2001). Herpes simplex virus vectors for the nervous system. Curr. Gene Ther. 1, 339–358. Lledo, P. M., and Saghatelyan, A. (2005). Integrating new neurons into the adult olfactory bulb: joining the network, life-death decisions, and the effects of sensory experience. Trends Neurosci. 28, 248–254. Luo, L., Callaway, E. M., and Svoboda, K. (2008). Genetic dissection of neural circuits. Neuron 57, 634–660. Ma, D. K., Kim, W. R., Ming, G. L., and Song, H. (2009). Activity-dependent extrinsic regulation of adult olfactory bulb and hippocampal neurogenesis. Ann. N. Y. Acad. Sci. 1170, 664–673. Miesenbock, G., De Angelis, D. A., and Rothman, J. E. (1998). Visualizing secretion and synaptic transmission with pH-sensitive green fluorescent proteins. Nature 394, 192–195. Ming, G. L., and Song, H. (2005). Adult neurogenesis in the mammalian central nervous system. Annu. Rev. Neurosci. 28, 223–250. Miyamichi, K., Amat, F., Moussavi, F., Wang, C., Wickersham, I., Wall, N. R., Taniguchi, H., Tasic, B., Huang, Z. J., He, Z., Callaway, E. M., Horowitz, M. A., and Luo, L. (2011). Cortical representations of olfactory input by trans-synaptic tracing. Nature, doi:10.1038/nature09714. Mizrahi, A., Lu, J., Irving, R., Feng, G., and Katz, L. C. (2006). In vivo imaging of juxtaglomerular neuron turnover in the mouse olfactory bulb. Proc. Natl. Acad. Sci. U.S.A. 103, 1912–1917. Nagel, G., Szellas, T., Huhn, W., Kateriya, S., Adeishvili, N., Berthold, P., Ollig, D., Hegemann, P., and Bamberg, E. (2003). Channelrhodopsin-2, a directly light-gated cation-selective membrane channel. Proc. Natl. Acad. Sci. U.S.A. 100, 13940–13945. Nagel, G., Szellas, T., Kateriya, S., Adeishvili, N., Hegemann, P., and Bamberg, E. (2005). Channelrhodopsins: directly light-gated cation channels. Biochem. Soc. Trans. 33, 863–866. O’Connor, D. H., Huber, D., and Svoboda, K. (2009). Reverse engineering the mouse brain. Nature 461, 923–929. Overstreet Wadiche, L., Bromberg, D. A., Bensen, A. L., and Westbrook, G. L. (2005). GABAergic signaling to newborn neurons in dentate gyrus. J. Neurophysiol. 94, 4528–4532. Panzanelli, P., Bardy, C., Nissant, A., Pallotto, M., Sassoe-Pognetto, M., Lledo, P. M., and Fritschy, J. M. (2009). Early synapse formation in developing interneurons of the adult olfactory bulb. J. Neurosci. 29, 15039–15052. Park, M., Salgado, J. M., Ostroff, L., Helton, T. D., Robinson, C. G., Harris, K. M., and Ehlers, M. D. (2006). Plasticity-induced growth of dendritic spines by exocytic trafficking from recycling endosomes. Neuron 52, 817–830. Pathania, M., Yan, L. D., and Bordey, A. (2010). A symphony of signals conducts early and late stages of adult neurogenesis. Neuropharmacology 58, 865–876. Petreanu, L., and Alvarez-Buylla, A. (2002). Maturation and death of adult-born olfactory bulb granule neurons: role of olfaction. J. Neurosci. 22, 6106–6113. Petreanu, L., Huber, D., Sobczyk, A., and Svoboda, K. (2007). Channelrhodopsin-2-assisted circuit mapping of long-range callosal projections. Nat. Neurosci. 10, 663–668. Rancz, E. A., Franks, K. M., Schwarz, M. K., Pichler, B., Schaefer, A. T., and Margrie, T. W. (2011). Transfection via whole-cell recording in vivo: bridging single-cell physiology, genetics and connectomics. Nat. Neurosci. 14, 527–532. Rochefort, C., Gheusi, G., Vincent, J. D., and Ledo, P. M. (2002). Enriched odor exposure increases the number of newborn neurons in the adult olfactory bulb and improves odor memory. J. Neurosci. 22, 2679–2689. Santarelli, L., Saxe, M., Gross, C., Surget, A., Battaglia, F., Dulawa, S., Weisstaub, N., Lee, J., Duman, R., Arancio, O., Belzung, C., and Hen, R. (2003). Requirement of hippocampal neurogenesis for the behavioral effects of antidepressants. Science 301, 805–809. Shepherd, G. M. (2004). The Synaptic Organization of the Brain, 5th Edn. New York: Oxford University Press. Shimomura, O., Johnson, F. H., and Saiga, Y. (1962). Extraction, purification and properties of aequorin, a bioluminescent protein from the luminous hydromedusan, Aequorea. J. Cell. Comp. Physiol. 59, 223–239. Shipley, M. T., and Ennis, M. (1996). Functional organization of olfactory system. J. Neurobiol. 30, 123–176. Song, H. J., Stevens, C. F., and Gage, F. H. (2002). Neural stem cells from adult hippocampus develop essential properties of functional CNS neurons. Nat. Neurosci. 5, 438–445. Stepien, A. E., Tripodi, M., and Arber, S. (2010). Monosynaptic rabies virus reveals premotor network organization and synaptic specificity of cholinergic partition cells. Neuron 68, 456–472. Suh, H., Deng, W., and Gage, F. H. (2009). Signaling in adult neurogenesis. Annu. Rev. Cell Dev. Biol. 25, 253–275. Tan, E. M., Yamaguchi, Y., Horwitz, G. D., Gosgnach, S., Lein, E. S., Goulding, M., Albright, T. D., and Callaway, E. M. (2006). Selective and quickly reversible inactivation of mammalian neurons in vivo using the Drosophila allatostatin receptor. Neuron 51, 157–170. Toni, N., Laplagne, D. A., Zhao, C., Lombardi, G., Ribak, C. E., Gage, F. H., and Schinder, A. F. (2008). Neurons born in the adult dentate gyrus form functional synapses with target cells. Nat. Neurosci. 11, 901–907. van Praag, H., Christie, B. R., Sejnowski, T. J., and Gage, F. H. (1999). Running enhances neurogenesis, learning, and long-term potentiation in mice. Proc. Natl. Acad. Sci. U.S.A. 96, 13427–13431. Voyles, B. A. (1993). The Biology of Viruses, 1st Edn. St. Louis: Mosby-Year Book. Wang, H., Peca, J., Matsuzaki, M., Matsuzaki, K., Noguchi, J., Qiu, L., Wang, D., Zhang, F., Boyden, E., Deisseroth, K., Kasai, H., Hall, W. C., Feng, G., and Augustine, G. J. (2007). High-speed mapping of synaptic connectivity using photostimulation in channelrhodopsin-2 transgenic mice. Proc. Natl. Acad. Sci. U.S.A. 104, 8143–8148. Wehr, M., Hostick, U., Kyweriga, M., Tan, A., Weible, A. P., Wu, H., Wu, W., Callaway, E. M., and Kentros, C. (2009). Transgenic silencing of neurons in the mammalian brain by expression of the allatostatin receptor (AlstR). J. Neurophysiol. 102, 2554–2562. Weible, A. P., Schwarcz, L., Wickersham, I. R., Deblander, L., Wu, H., Callaway, E. M., Seung, H. S., and Kentros, C. G. (2010). Transgenic targeting of recombinant rabies virus reveals monosynaptic connectivity of specific neurons. J. Neurosci. 30, 16509–16513. Whitman, M. C., and Greer, C. A. (2009). Adult neurogenesis and the olfactory system. Prog. Neurobiol. 89, 162–175. Wickersham, I. R., Finke, S., Conzelmann, K. K., and Callaway, E. M. (2007a). Retrograde neuronal tracing with a deletion-mutant rabies virus. Nat. Methods 4, 47–49. Wickersham, I. R., Lyon, D. C., Barnard, R. J., Mori, T., Finke, S., Conzelmann, K. K., Young, J. A., and Callaway, E. M. (2007b). Monosynaptic restriction of transsynaptic tracing from single, genetically targeted neurons. Neuron 53, 639–647. Willhite, D. C., Nguyen, K. T., Masurkar, A. V., Greer, C. A., Shepherd, G. M., and Chen, W. R. (2006). Viral tracing identifies distributed columnar organization in the olfactory bulb. Proc. Natl. Acad. Sci. U.S.A. 103, 12592–12597. Zhang, C. L., Zou, Y., He, W., Gage, F. H., and Evans, R. M. (2008). A role for adult TLX-positive neural stem cells in learning and behaviour. Nature 451, 1004–1007. Zhang, F., Aravanis, A. M., Adamantidis, A., de Lecea, L., and Deisseroth, K. (2007a). Circuit-breakers: optical technologies for probing neural signals and systems. Nat. Rev. Neurosci. 8, 577–581. Zhang, F., Wang, L. P., Brauner, M., Liewald, J. F., Kay, K., Watzke, N., Wood, P. G., Bamberg, E., Nagel, G., Gottschalk, A., and Deisseroth, K. (2007b). Multimodal fast optical interrogation of neural circuitry. Nature 446, 633–639. Zhang, F., Gradinaru, V., Adamantidis, A. R., Durand, R., Airan, R. D., de Lecea, L., and Deisseroth, K. (2010). Optogenetic interrogation of neural circuits: technology for probing mammalian brain structures. Nat. Protoc. 5, 439–456. Zhao, C., Deng, W., and Gage, F. H. (2008). Mechanisms and functional implications of adult neurogenesis. Cell 132, 645–660. Zhao, G. Q., Zhang, Y., Hoon, M. A., Chandrashekar, J., Erlenbach, I., Ryba, N. J., and Zuker, C. S. (2003). The receptors for mammalian sweet and umami taste. Cell 115, 255–266. Published online: 05 April 2011. Copyright: © 2011 Arenkiel. This is an open-access article subject to a non-exclusive license between the authors and Frontiers Media SA, which permits use, distribution and reproduction in other forums, provided the original authors and source are credited and other Frontiers conditions are complied with.